Its summer and the sun can really be bright and when it reflects on and off the uneven surface of the road in the mornings and evenings, it overstimulates the photo receptors intermittently. This causes discomfort to your eyes as they have to repeatedly adjust to the changing brightness resulting in increased response time which can be fatal at high speed especially on expressways. So the other day I bought a pair of sunglasses. The shopkeeper seemed helpful but in retrospect I think he was only being convincing to make a sale. I already wear spectacles of around -1.5 D in each eye. Both cylindrical. So I asked him to use powered lens for the sunglasses. And so I started using the glasses and acquired a smug look on my face. Two days ago, a gang of six rowdy guys all in their 20s in a speeding auto-rickshaw tried to overtake me from the wrong side as I was slowly making a left turn at a signal. Their auto hit the front of my car and the left side of the front bumper came off. The damage wasn't significant and I was able to snap on the bumper back into its place. not compensate for the other drivers mistake - or in this case, blatant breaking of traffic law? The spectacles I usually wear are frame less and allow me to look sideways through the corner of my eyes. The sunglasses on the other hand have a thick frame (do I really wanna look macho at the possible cost of damage to my car or life?) which block my peripheral vision. 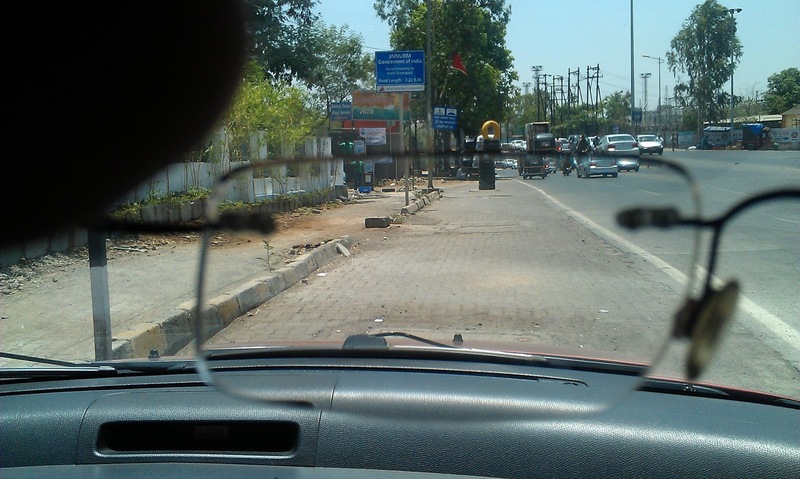 And so I didn't notice the auto-rickshaw approaching at high speed from my left side until it was too late. I only blame the gang of rowdy dunderheads for whatever little damage my car sustained. But I couldn't help but think about the sunglasses vendor. He has been selling glasses for years. Didn't all those years of experience teach him that glasses with frames block peripheral vision and can increase the time until you notice someone overtaking you from the wrong side? All he had to do was to suggest frameless sunglasses when I specifically told him that I needed them for driving in bright sunlight. Maybe he doesn't use his own glasses on himself. Maybe he is too dumb to notice the difference between glasses with and without frames while driving or riding his bike. Maybe he never cared for customer feedback. Maybe he lack the desire to become better at his job. And so I wonder, can you really prosper if you and the people around you lack the desire to become better and better at what we do? My normal pair of spectacles with unhindered peripheral vision. Sunglasses with thick frames blocking peripheral vision. 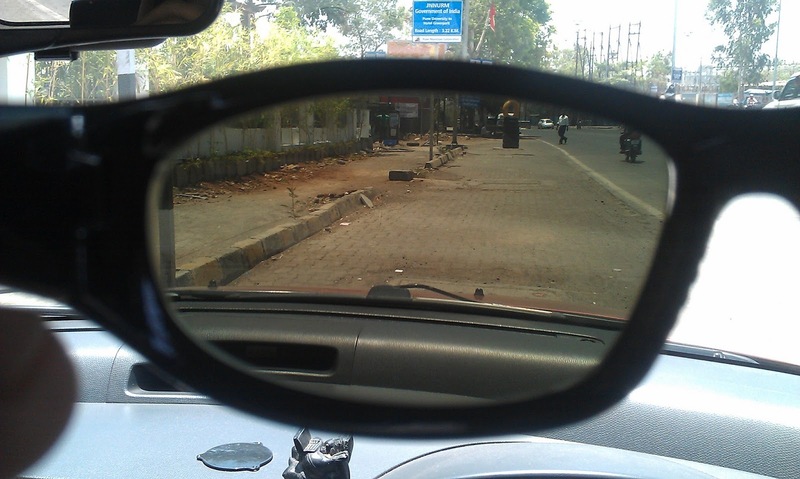 Got new half framed sunglasses made from the same outlet for INR 2000 (powered lens). The guy there offered to replace the lenses of my previous thick frame sunglasses for free so that I could pass them on to any of my family or friends. Also he gave me the spare original unpowered lenses for this new sunglasses - if in case in the future, I decided to get contact lenses or lasik, I could swap the powered lenses with these unpowered ones. New sunglasses with semiframes. 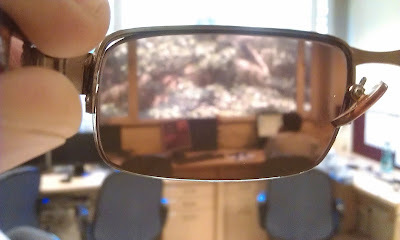 Peripheral vision no longer blocked.